The Armstrong Siddeley Genet is a small 5-cylinder air-cooled 80 horsepower radial engine, and is a small and early product of the British Armstrong Siddeley who produced a successful range of low and mid power radial engines prior to World War II including the 5 cylinder Genet in 88 and 110HP versions, the 5 cylinder 165HP Mongoose, the 7 cylinder 235HP Lynx and Cheetah Engines, and the double row Leopard, Jaguar and Panther. While all of the Armstrong Siddeley radial engines were named after "big cats" their post war jet engines were named after "snakes" and included the Viper engine developed for the GAF Jindivik, and the Double Mamba turboprop engine used in the Fairey Gannet anti submarine aircraft. 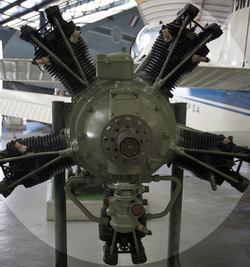 The Genet was designed by Armstrong Siddeley in 1926 for light training and sporting aircraft, the engine quickly built up a good reputation for reliability. In 1934 Captain Bremer piloted his Genet-powered Junkers Junior in a 22-country around-the- world flight, with the exception of the Atlantic and Pacific Ocean crossings, when it was transported by ship. The Genet design led to larger 7 cylinder radial engines including the Cheetah series that saw extensive service in Australia in over 1000 Avro Anson's and nearly 400 Airspeed Oxford twin engined trainers during WW2.